Are you at the point where it cannot get any worse? Are you running on empty? Did you make a big sacrifice and end up with nothing? Is your only power in making self-deprecating remarks? Has someone recently walked all over you? 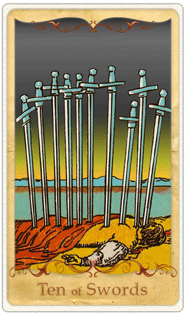 The Ten of Swords is the Tarot’s card of bottoming out. But this card is a blessing in disguise, as the darkest hours in which you suffer are about to give way to a new dawn. Indicating that you have reached bottom, there is nowhere to go but up when your Tarot reader draws the Ten of Swords. It ain’t pretty. There is a man’s body laying face down in the soil. Ten Swords are stabbing him in the back from the base of his neck to his thighs. Each stands erect, having been plunged deep into him. All of his blood has drained out, covering most of his torso and legs. Out past the earth on which his body lays is a vast body of water and far away a hilly landscape. The sky above him is blacker than night, but on the horizon, a golden yellow sky is bursting forth. 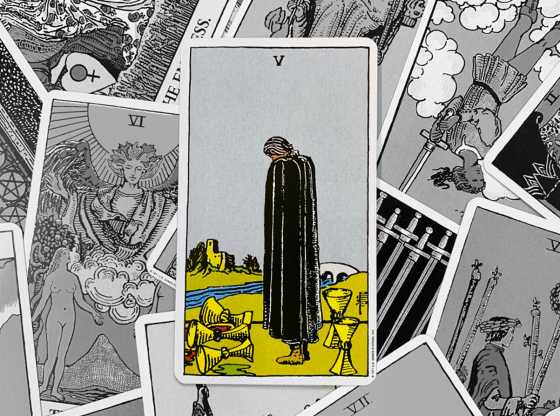 Death is seen as a gateway to another plane in the Tarot, a metaphor for change. The key to this card is the golden dawn rising above the eastern hills. The death taking place at the forefront of this card is placed literally at the bottom of the illustration. The Ten of Swords is actually a clarion for achievement. Many people start their marches toward success when the old way of doing things has died. As swords are representations for ideas and words, the Ten of Swords can represent needing to talk an idea to death before inspiration on a new way of doing things suddenly arises. 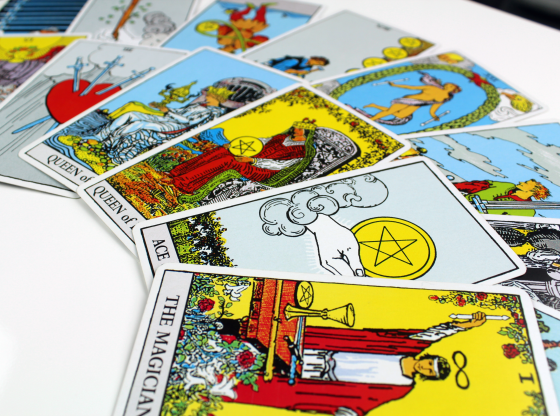 Your Tarot reader will choose one of many Tarot spreads for your reading. 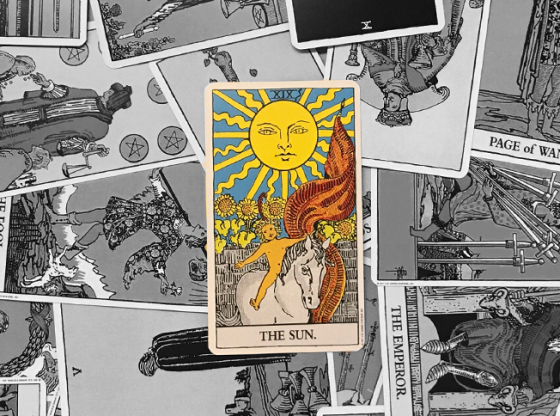 When the cards are laid out, each one will fall into a position representing the past, the present or the future. The meaning of a card is subtly different depending on the position in which it lands. When the Ten of Swords is in the past position, the worst is over. Perhaps a few years ago you went through a horrible breakup with someone you assumed was a soulmate or maybe you recently left an abusive relationship. Your childhood may have had some trauma from which you have long since moved on. 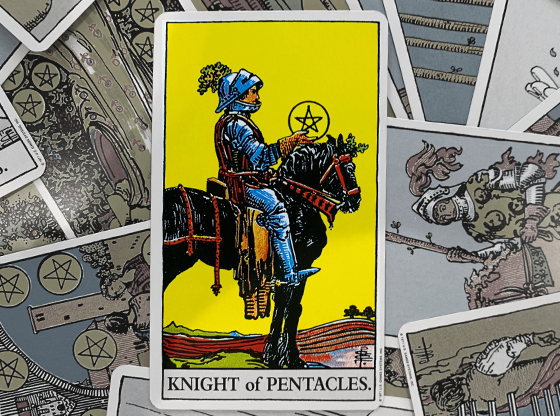 It is great to have this card in the past position as it provides a definitive assurance that the worst is all behind you. In the present position, this card is a confirmation that you are turning a corner and leaving behind one of the worst chapters in your life. Keep a mental image of that golden sky rising … your world is about to get brighter, as it hardly could ever be any darker than some recent dramas you have encountered. 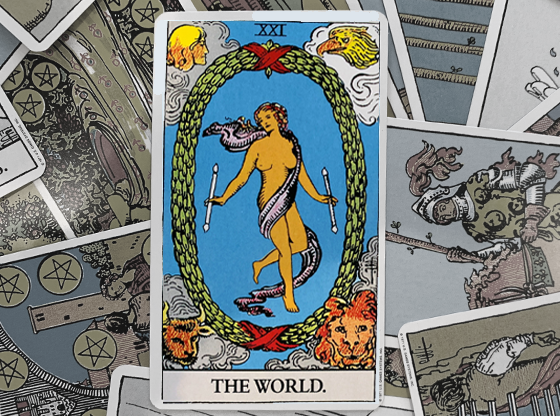 As you might guess, the future position of your reading is not exactly the best place to find the Ten of Swords. This indicates that you are headed toward a bottom. Whether or not your future will be a slow descent from your present position or a rapid fall remains to be seen. There are many ways the Ten of Swords combines with other cards in your reading, but the silver lining of this card remains. Even when you bottom out in the future, play martyr for a cause, or are forced to put yourself down, the golden dawn brings an end to the trauma in the light of a new day. 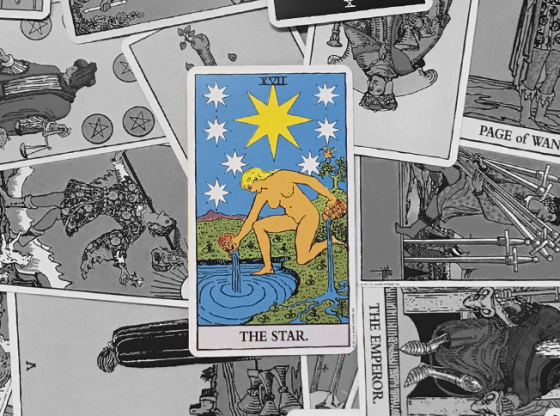 Every Tarot reading features cards laid out. 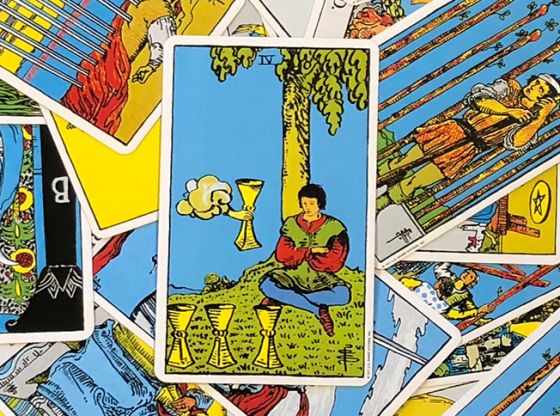 In the act of setting them down next to each other, your Tarot reader can inform you of how the energy of each card blends with those around it. 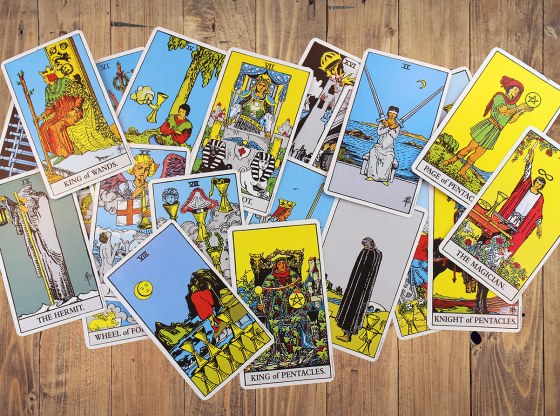 Core meanings can be influenced and a more distinct Tarot reading emerges when the combination of all the cards in the reading are considered. 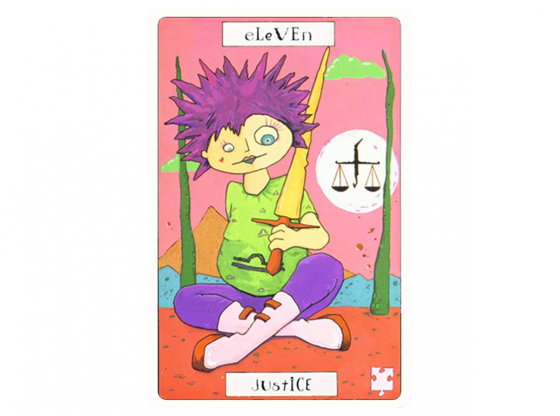 The Ten is the lower echo of three cards in the Tarot’s Major Arcana: The Wheel of Fortune (Card #10), Judgment (Card #20) and The Fool (Card #0). 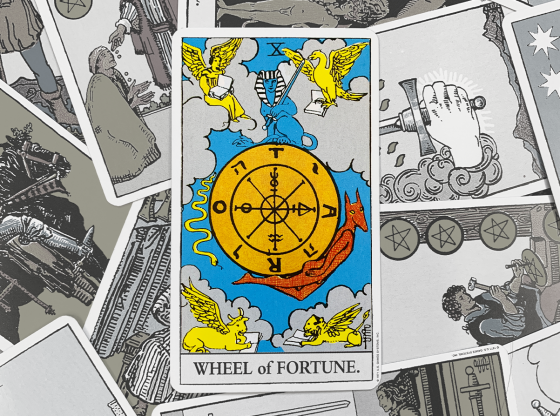 The Wheel of Fortune is the card that that reminds us that all circumstances change, that the rich could be poor tomorrow and vice versa. This is recalled by the beautiful heralding of a new tomorrow amidst the abject violent end illustrated on the Ten of Swords. Judgment is a card of deciding a new path to follow and sticking to it no matter the cost. The Ten of Swords echoes this absolutist position. The Fool is a card of heaving one’s fate straight into the unknown, which is mirrored by the Ten of Swords by underscoring that once one has reached bottom, the true adventure of living, recovery, has just begun. If any of these cards is in your reading that includes the Ten of Swords, these themes are the centerpiece of your reading. When The Hermit card is in your reading, your bottoming out period will be a lonely one, most likely caused by your own vices. If The Tower card is in your reading, at least you will be able to blame your fall on some influence of the outside world that mitigates your responsibility. When Strength and the Ten of Swords are in a reading, your valiant fight was a losing battle, but you will get up to do battle again. When The Hanged Man is present, the Ten of Swords represents your martyrdom for a cause. Perhaps you will get fired from a job in order to help your friends there keep their jobs. When Temperance is in the reading, there has been a pattern of avoiding pleasure and not taking credit that has led to your current state of misery. Realizing your own role in avoidant behavior will bring the golden light of sunrise into your life much faster.